Zonderkidz and author Sally Lloyd-Jones are making this Advent guide and printables available to you for FREE through FaithGateway! 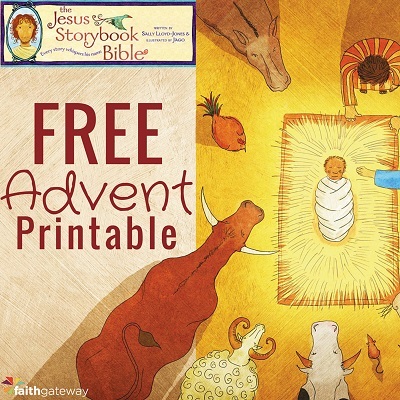 Each day for 24 days you take one of the cards, read the corresponding Scriptures on the back, then read the companion story in The Jesus Storybook Bible. It's super easy and fun for the entire family! Along with each Scripture reading is a corresponding story to read from The Jesus Storybook Bible by Sally Lloyd-Jones, one of the most beloved children’s picture book Bibles in which every story points to Christ. You and your children will read 21 stories from the Old Testament—each ending with a paragraph that ties into the imminent birth of Jesus—and then 3 stories from the New Testament about the birth story of Jesus. If the form or reCaptcha is not working for you, please contact our customer support team. reCaptcha is powered by Google and doesn't always work on every browser or device. We'd be happy to assist you and get you signed up! Contact us here.